A few weeks ago I saw a tutorial on the National Association of Photoshop Professionals (NAPP) site by Corey Barker that demonstrated how to produce a kaleidoscope effect using Photoshop. Corey illustrated the technique with an image of a dripping faucet but my mind went immediately to using flowers and other botanicals to produce abstract images. Since then, I’ve spent many hours exploring this technique and learning what works best for me. 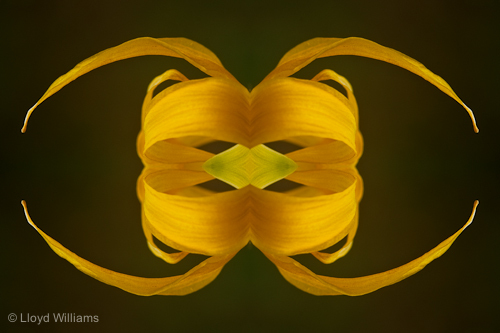 The image above is a portion of a Glacier Lily that has been reflected left to right and then top to bottom. This entry was posted on Friday, February 18th, 2011 and is filed under Out of the Box. Both comments and pings are currently closed. Copyright © Lloyd Williams. All rights reserved. Content on this site may not be reproduced without written permission from Lloyd Williams.